If the ticket is valid only for July 23, what is the "4 days starting from July 23" doing here? Is it valid for all 4 days or just 1? In addition, apparently the 11880 yen ticket is split into 7340 and 4540 yen. The former is marked 乗 and the latter 特. What does this mean? TL;DR: Your (full) ticket is valid only on July 23rd. Japanese bullet train fares consist of two components: there's the base fare (乗車券 jōshaken, "board train ticket") plus the special fare (特定特急券 tokutei tokkyūken, lit. "specific special express ticket"), which is for Shinkansen bullet trains as opposed to ordinary express trains. 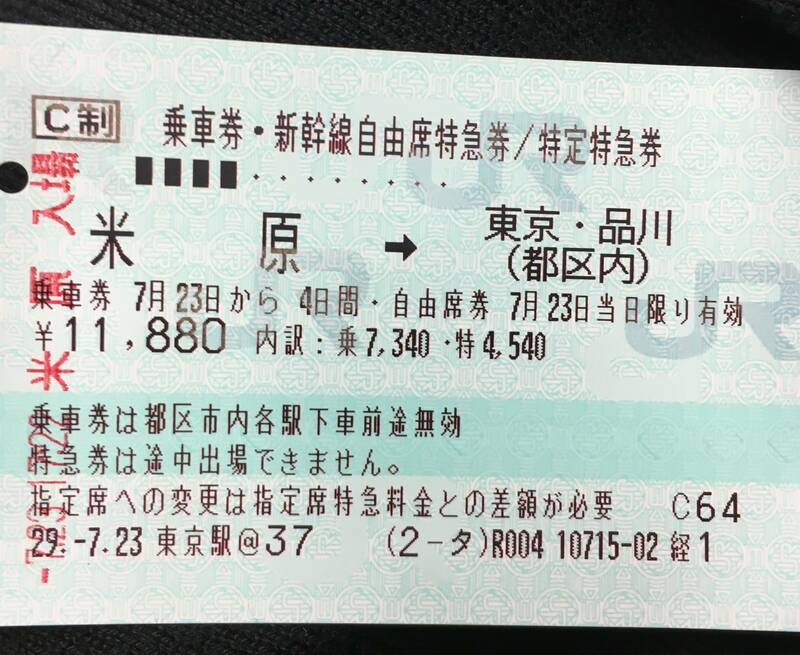 For your ticket, the base fare (乗) is valid for four days, but the special fare (特) -- which is without a reserved seat, hence 自由席 (jiyūseki) -- is valid only on the 23rd. So you could, for example, travel to Nagoya by bullet train, stop for a few days, and then continue to Tokyo by local (non-express) train... although it wouldn't actually make any sense to do so, because it would be cheaper to get a bullet train fare to Nagoya only and continue with a separate ordinary ticket. Where to get Ghibli museum tickets: JTB or Lawsons?